The University of the Fraser Valley wrestling teams are flying to Calgary this week to participate in the Canada West championship, and they’re hoping to come back home with a banner. It might seem like an incredibly lofty goal, given the fact the Cascades wrestling program is in just its first year of Canada West competition. But UFV has found instant success in its debut campaign, particularly on the men’s side. The UFV men won both conference tournaments they entered in the second semester – the Golden Bear Open on Jan. 9, and their home Cascades Classic tourney on Feb. 1. Those results have sparked a rapid rise up the Canadian Interuniversity Sport (CIS) rankings, and the Cascades men have held the No. 1 spot in the national poll for the last four weeks. They’re just the second team in UFV history to earn a No. 1 CIS ranking – the women’s basketball squad was tops in the nation for two weeks in January 2013. Standouts for the men’s team include Aso Palani (61 kg), Devin Purewal (72 kg), Jasmit Phulka (82 kg), Chanmit Phulka (100 kg) and Manheet Kalhon (130 kg). All five wrestlers have won individual gold medals at Canada West tournaments this season, and Palani, Kalhon and Jasmit Phulka have earned two golds apiece. Last week, Jasmit Phulka traveled with the Canadian national team to the U.S. Olympic Training Center in Colorado Springs, and Virdi believes he’ll be extremely sharp in the wake of some high-level training and competition there. On the women’s side, UFV’s top finisher at the Cascades Classic was Shae Corwin, who finished fifth at 51 kg. 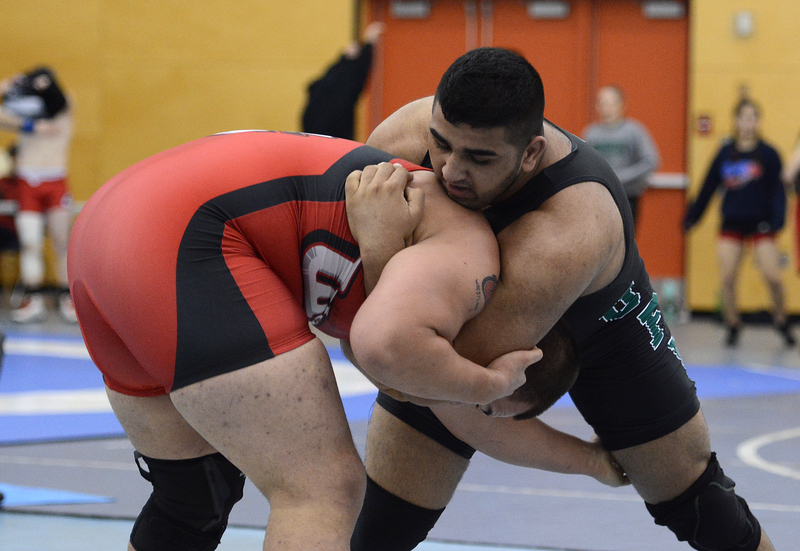 Virdi knows what it takes to succeed at the Canada West championship – he participated in three of them during his career with the Simon Fraser Clan, and won three individual gold medals. The conference championship is a unique ‘dual meet’ round-robin format, and the top three wrestlers in each weight class qualify for CIS nationals. The Alberta Golden Bears and Pandas are the reigning Canada West wrestling champs on both the men’s and women’s sides – they’ve won the last three men’s conference titles, and four consecutive women’s crowns. The tournament runs Friday and Saturday at the U of C’s Jack Simpson Gym. The Cascades basketball teams wrap up their Canada West regular season schedules at home this weekend, facing the Thompson Rivers WolfPack. Games run Friday (women 6 p.m., men 8 p.m.) and Saturday (women 5 p.m., men 7 p.m.) at the Envision Athletic Centre. Saturday is Senior Night – graduating fifth-year players Jasper Moedt and Kadeem Willis of the men’s team and Sarah Wierks and Celeste Dyck of the women’s squad will be recognized between games. Both UFV squads are locked into their post-season seedings – the men (16-2) clinched first place in the Explorer Division two weeks ago, while the women (11-7) punched their playoff ticket last weekend and can finish no higher or lower than third in the Explorer. But for both teams, playing TRU represents a valuable test going into the playoffs. The WolfPack men (10-8) have plenty left to play for. They’re currently tied for second in the Explorer Division with UNBC, and the runner-up spot in the division comes with a bonus prize – a first-round playoff bye. One interesting statistical storyline to follow in the UFV-TRU men’s clash is the race for the Canada West rebounding title. Josh Wolfram, the WolfPack’s standout 6’10” fourth-year forward, leads the conference at 10.6 boards per game. Jasper Moedt, the Cascades’ all-star 6’7” centre, is right behind him at 10.5. Slowing Wolfram will be paramount for the Cascades – he also ranks fifth in conference scoring at 19.0 points per game. On the women’s side, TRU earned a spot in the CIS national rankings this week at No. 10, and they’ve clinched top spot in the Explorer Division at 17-1. “For us, it’s exciting to be playing a ranked opponent again,” UFV head coach Al Tuchscherer said. “It’s a real test to see where we’re at against one of Canada West’s elite teams. Cascades fifth-year centre Sarah Wierks is second in the conference in scoring (19.6) and leads the nation in rebounding (15.8), and she’s within range of setting Canada West single-season records for total rebounds, rebounding average and double-doubles this weekend. Taiysa Worsfold paces the WolfPack in scoring at 13.2 points per game, and outstanding rookie Michelle Bos is second in the conference in rebounding at 11.8 per game. The UFV volleyball teams are off to North Vancouver this weekend for a crucial Friday-Saturday set against the Capilano Blues. Games run at 6 p.m. (women) and 8 p.m. (men) both nights, and can be viewed live online at sportscanada.tv/pacwest. It’s the second-last weekend of the PacWest regular season, and it looms particularly large for the Cascades men’s squad. UFV (6-14), College of the Rockies (5-15) and Capilano (4-16) occupy fifth, sixth and seventh place, respectively, in the PacWest. Only the top six will advance to the playoffs, and the Cascades can punch their ticket with a weekend sweep. “At the end of the day, we’re in control of our own destiny,” UFV head coach Kyle Donen said. “We take care of business this weekend, and we’re in the playoffs. The Cascades women are No. 15 in the CCAA national rankings, and sit in fifth place in the PacWest at 10-10. They’ve already clinched a playoff berth. They face stiff test in the Blues (14-6), who are second in the PacWest and ranked No. 9 in the CCAA. The two teams split a two-game weekend in Abbotsford back in November.